But since there's zero ork players at my local shop I've decided to remedy that here in 2019. There's a bit of work involved here, so I'm thinking closer to summer. 3) Later in the year I'll turn my attention to the SoB. So what are you all working on for 2019? 4) Make room for and collect Primaris (Emperor's Spears) and Sisters of Battle. 5) Decide what I want to do regarding my Thousand Sons; I no longer have 2k points thanks to FAQ, I don't like the aesthetic of Tzaangors, and I need to leave/make some room for the above. Fine tune my Craftworlds, get my Tyranids ready and painted for an Escalation league, and Blades of Khorne ready for another Escalation League. Also will squeeze Deathguard I received at Christmas somewhere in there. Most likely all these plans will fail, but at least I'll get to play and paint some Warhammer this year. Paint the rest of my 2k Tau list and kill team options. Build and paint a 2k point Adeptus Titanicus force that's been sitting on my shelf for a bit. Paint all of the terrain I have lying around. 1. Really go to town to finish my Iyanden army. 2. Build my knights and Loyal 32 (with Anvil Industry conversion heads). So please GW, do NOT bring out anything else cool before Sisters. Weclome to the airbrush game Lemondish! You're going to love it. My top tips would be a) keep your brush clean b) use a touch more thinner/water than you think. Keep the thing de-gunked and it will be a joy. My plan for the year is lean heavily into my Exodite Craftworld army! I played Eldar when I was a kid back in 2nd edition, and have no idea why it's taken me this long to start them back up. Hope you all have a great year of hobby ahead of you! Hope to finish painting my SoB army. Got everything down pat, just need to make the time to paint my last 40 bolter girls, 3 seraphim and handful of ecclesiarchy units. Oh, and one more exorcist. 1) Use Talos/Cronos bits to convert the Crypt Horrors (which I can no longer use) into Grotesques. 2) Remember that I already used up all my Talos/Cronos bits converting some Ogrun Warspears into Grotesques. 3) Scour ebay for a cheap Talos. 4) Fail to find cheap Talos. 6) Persuade GW to give Dark Eldar HQs options for wings, so that I can actually use my stupid winged-HQ conversion thing. 7) Fail utterly and move on to next army. 1) Finish assembling the Wraiths I got for Christmas. 2) Actually finish assembling the Wraiths I got for Christmas. 3) Assemble the Triarch Praetorians I got for Christmas (the joys of ebay). 4) Try to remember why I bought Triarch Praetorians in the first place. 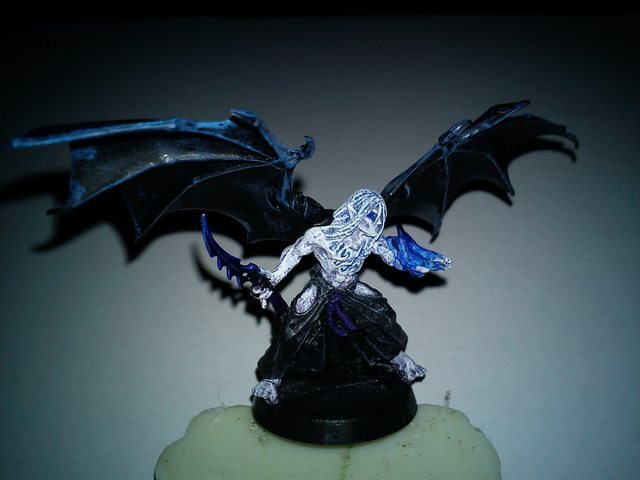 5) Paint the Wraiths and Praetorians. 6) Remember that I hate painting and move to next army instead. 1) Finish assembling the Scions that I got last Christmas. 2) Finish making the characters for my Hail Hydra army. 3) Regret the time I spent making characters for my Hail Hydra army. 4) Finish making my weird conversion things for my non-Hydra army. 5) Paint all the above along with my million or so guardsmen. 6) Remember that I hate painting guardsmen even more than Necrons and go back to Dark Eldar. I think that should see me nicely into 2020. Finish building and painting my Crimson Fists. So far, only a handful of Marines are fully painted, so I really need to buckle down this year. Hopefully before the next wave of Primaris hits and I get sidetracked with more stuff to add on to them. My army is rapidly becoming Primaris only (only Pedro Kantor, a squad of Lascannons Devastators, sniper Scouts, and a squad of Terminators is all that is left of my regular Marines). Assemble all my Blackstone Fortress minis. Not a lofty goal but I don't get a great deal of hobby time these days. Grow cult armies, both Slaanesh and Genestealers, organically by playing small scale battles, painting new models as they are added. Plan to do lots of photos, and post campaign rules + battle reports. want to try really nerding out for a year. Paint my Imperial Knights army and an allied detachment of all Primaris Salamanders. Maybe I'll do a classic marine battle company later this year? Depends on what the Primaris releases are like. Ideally...I wouldn't and shouldn't buy or do anything until sisters drop. But of course things never work out that way, i'm already being sidetracked by the moonclan grots and the potential slaanesh release which will very likely be before sisters come out. My backlog is enormous...and I need to finish building and painting my whole blackstone fortress set. 12) Stick to this schedule, (not necessiarly in order) and don't fail at no. 10. First half of the year I'll try to concentrate on my Daemons. Great Unclean one, 30 Plague Bearers and 6 Drones are waiting to be painted. Maybe also the Plague Hulk, but without any points changes in CA he's a little sad. In that Context also Gellarpox Infected. I sold my Death Guard and have bought the start of a Genestealer Cult army (before I even knew that there was going to be a new codex). My plan is actually build and paint a unit at a time, and slowly increase over the year. Play some cool fluffy games and have a good time doing so. I haven't been serious about 40k in many years but in the second half of 2018 I came back to the hobby with a vengeance. It was for a number of reasons but what helped a bunch was my buddy joining the hobby. I've been on a roll since then and I want to keep that going in 2019. I'd like to accomplish a few or all of these goals. 1. Buy and paint completely one unit at a time with my Flesh Tearers. I really wanted to buy the new primaris marine kits because I like the look of them and chose the Flesh Tearers as my Chapter. I've been buying only one box at a time and painting them completely before moving on. Id like to keep that going and see at the end of the year how much I've accomplished. 2. Play in at least one tournament. I'm ashamed to say I've never participated in a 40k tournament. I think I should be able to this year with the way I've been progressing with my armies and the way I've been absorbing the 40k meta. I don't have any particular goals for winning but its something I hope to be competitive with. 3. Master my Drukhari. They've been my main army for years but I've never been the most competitive player. In combination with goal number 2 I'd like to learn the ways to play competitively with them and see if I can do well against other competitive players. 4. Finally I want to get my friend further into the 40k hobby and mentor him in playing and hobbying. Its been fun to teach someone the game of 40k and hope its something we can do throughout the year together. edit: Almost forgot, also wanted to buy and learn how to airbrush. 1. Work on my 30k Blood Angels army. 2. Get the new Sisters models when they come out and make an allied force for my 40k Blood Angels. 3. Possibly expand my Dark Eldar with some coven models. Since I currently only have Kabal and Wyches. I'll try to finally stop caring about GW and 40k. Project is Drukhari. I had a DE army back in the 3rd ed. It was really fun to play, but then I switched to Eldar which I play regularly. No other project this year. 3.) Fill the gaps in my Tau army. 4.) Expand my Eldar army. 5.) Paint my Kill Team terrain. 1. Finish this Kill Team/Gaslands table I started last week. 22x30 is so cute, it's like a baby gaming table! 2. Paint my Harlequin kill team. 3. Add to/finish my Genestealer Cult kill team. 4. Build a Gaslands squad. get the models from Conquest! finished, the marines go with a current small force to force something hopefully usable, the Death Guard have a few bits on order to go with them. aim to have both on the table first half of the year while growing. Death Guard - I am almost done painting my questoris renegade knight, so after that is done I need to convert a Chaos Lord, make a Nurgle Sorceror on Palanquin, and I bought some cultists counts as, as well as some blightlord terminators. Looks like ill be busy in 2019! This year I hope to go back detail most of my models. Most of my collection has their colors blocked in and maybe a wash applied. This is generally my minimum acceptable tabletop quality. However, I have really been enjoying playing Kill Team far more than regular 40K. Since far less models are used, I feel I need to up the model detail. I also don't want my troops to be the best looking part of my army so everything should get fancier paint jobs to match. Speaking of Kill Team, I have been starting a bunch of new factions (Tau, Necrons, Admech, Grey Knights, Genestealer Cult) most still need a lot of work. For the Grey Knights, I even plan to try and paint the force weapons more like how GW does them. As for new stuff, I don't have much more planned unless GW releases new Chaos Space Marine models and/or Abbadon. I don't mind the new Worldclaimer dude, but unless I can get him for about $20, I don't like that much. 1) Learn to use the airbrush that I just got. 2) Don't start any new armies. I don't need anymore models right now. I've learned that GW will always have a sweet bundle or new model out. Buying something to stash it now doesn't make sense because it just stops you from getting that next sweet thing to come out. 3) Finish my Knights. This is close to being done. Models are magnetized and I have the leadbelcher primer ready. 4) Finish my necrons off. Again doable. I have 10 pretorians, two cloakteks, an ark and a TVault left. Everything except for the vault is mostly ready to paint. 5) Finish off my marines. Again doable. I have 10 termies, 10 bikes, a dread, 3 HQs and Sammy left. I feel like these 5 things need to happen asap. After that, my next goal is to get my fantasy stuff done. 6) Tomb Kings. I went on a binge and now I got a bunch of new stuff that needs to be built and painted. I'm waffling on whether to put them on these resin bases or just stick with plain ones. It's a lot of cash to spend on basing an army. 7) Orcs and Goblins. My army is old and mostly unpainted. I'm determined to get it done before starting anything else. If I decide to get some made to order stuff for my fantasy armies if that gets released. If the tomb kings troops ever get re-released that's going to be a lot of my money gone. I have no 40k projects mostly b.c i got into AOS heavily atm. 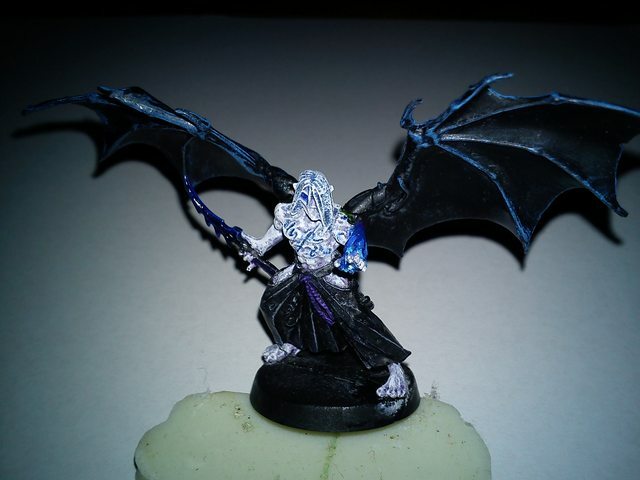 Painting my Beastmen in a ice theme. Hoping to get 2k done by March. 3. Bring my Daemons up to 3.5K. My goals as far as what I'm going to work on hobbywise are to paint my Blackstone Fortress models (the whole set if possible), tidy up my WIP collection by finishing a bunch of partially painted models that have been left languishing, and finish off a couple of box sets' models (namely Dark Imperium and Execution Force, both of which have just a handful of models left for me to paint). I've got more goals in my most recent post in my P&M blog. Paint more. My backlog has gotten bad last year and with all the new Black Stone models my group just got, I want to get at it again. Same as 2018, figure out how to make 8th edition worthwhile to play or figure out how to revive some more local interest in 7th edition. 8th is dreadfully unfun to play win or lose and my passion for the game has really flatlined. Love the setting, the hobby, and all my models to death but my god did GW do a good job of killing the fun for me. Got loads of models to paint but without the game to work towards it doesn't feel very compelling to batch paint 20 Fire Warriors or go beyond the base coat on some drop pods. Painstakingly paint each model as a painting showcase for army centerpieces. Nothing. Wait for rumors of SM codex 2.0, and see what I need to buy, assuming my whole army isn't squatted. I think most 40K players say this every year, but I'm gonna try and have all my minis painted by 2020. I sold minis I don't plan on doing anything with and I finally bought a airbrush to help with the workflow. So far off to a good start if I can keep from buying more miniatures. Well, I was a GW sucker (sorry guys I know i'm the problem) and bought a massive Vostroyan army. So i'll be finishing that hopefully by summer! Keep painting at the current pace I am, over 200 models done in 2018. Build some lists with the minis I have, and work out if there's any gaps. Try to keep purchases to what I need to fill out the lists rather than what I think looks cool. (I've got enough models I think look cool now). Start painting with more purpose. I need to start finishing army's off. My painting works well when I just pick up a random mini and paint it, but it's meant I've got lots forces I can't game with due to list construction. I intend to start painting with some coherency now. Start to actually get some games in. My local GW is a 10 minute drive, and I've only ever played at home. Once I have some viable lists, I plan to test them out in battle. Gaming is something that has suffered quite badly for me in 2018. Building/painting/playing/focusing on my Slaanesh army. Over Christmas break I almost finished one unit of Daemonettes, finished 4 heralds and 1 Chariot. So...not a bad start. 1, Photograph all 367 models I finished in 2018 (by the end of January, if at all possible). 2, Paint 1,000 points for my Imperium army, with the aim of making my current 8th ed Imperium stuff closer to a playable force. Must include 2 converted Inquisitorial Storm Trooper Officers. 3, Paint 1,000 points of Chaos (Death Guard & Nurgle Daemons), including a Nurgle Daemons Start Collecting box. 4, Paint 1,000 points of Eldar. Aspect Warriors from 2nd edition, Rogue Trader Avatar, modern plastics. 5, Learn to magnetise - Leman Russ, Wave Serpent as test beds. 6, Continue streaming on Twitch. Set up a M&P blog to post pictures after a stream to show WIPs. Continue painting my Mymeara Eldar on the side. New project will be a Fallen army with lots of bits from 30K to give them an old-school look. Might take an occasional break and work on some terrain as well. Finish up painting the rest of my honor company and begin painting my eldar with their black and yellow scheme. 1) Start the year by painting another 200 points worth of miniatures. 2) Buy the January edition of the new WD. 3) Attend my local gaming club's WH40K night regularly. I plan to SLOW DOWN dramatically. Especially since I got married, I've completely burned myself out (at no fault of my wife) on spending literally *all* of my free time assembling and painting models. I literally spent all of the free time I had on assembling and painting to the point where I had zero time to even play much less spend a little time on even on other hobby. Do I enjoy assembling models? Absolutely! Do I enjoy reading fluff and painting up models to match the fluff I read? Absolutely! Do I enjoy the thought of those models more-or-less coming to life on the table when I play? Absolutely! I honestly have no want to spend any real amount of time painting at all anymore because of how much time I spent this past year on trying to get armies of models painted. Will I work on painting Warhammer models this year? I'm sure I will. Right now, though, I'm sticking to mostly pre-painted Bandai models (Gundam, Star Wars, Star Blazers, etc.) and some unpainted WWII models that I will take my time painting as they are only a single model rather than an army's worth of models. 1) Pray for more plastic Eldar - plastic Aspect Warriors plzkthx GW! 3) Cry over the fact that I still can't paint! 5) Play with magnets with the Wraithknight I got in my Christmas present Battleforce! My only goal is to not start anything new. I am already worried about Test of Honour though. Get some paint on lots of Orks! Rebase my metal sisters in preparation for the new plastics. Really should finish building my Harlequins and Drukhari. Try and keep up with Conquest. They've got UMs and Salamanders for now, but my oldest recently expressed interest in getting a Guard Battalion with some tanks. My youngest may or may not want to build up some of his Necrons, but I'm not sure. He doesn't yet have a lot of painting endurance, so it's slow going. I might add some Eldar units here and there, but overall my 40k collection is pretty full. Paint a metric [bleep] ton of sisters. Yeah I'll join you in prayer for that. All I've got planned for 2019 is adding on a smaller detachment of Harlequins to my Eldar force so having some plastic Banshees and Scorpions to go along with that would be nice. The same thing it is every year Pinky. 1) Paint the Goliath Rockgrinder that I've dubed the fhtagn wagon and amuse myself senseless with Cthulhu jokes. 2) Hope for a rules leak so I can actually target which 500 points I want to get painted from my pile of assembled and primed genestealer cult before February. 2.) Assemble and paint that Army of tzeentch daemons i Just bought. Very scared of all that blending which i've never done before. Going back to the game. I have something like fifty dark angels primaris to paint, plus a repulsor and a knight to finish, and I will be ready to play again. I'm going a bit slowly tho. Get my blood angels up to 1K points, possibly as many as 2K. Start an Ulthwe army. Finishing my ongoing project to have all my Sisters repainted by the time the plastic ones come out so my old ones look good with new ones. Building and painting 11 more guardsmen I have on my desk. Finishing my battery of 25 pdr guns. Painting my company of T-34/85 tanks. Buying some infantry and more artillery, and figuring out what I'm doing with the aforementioned tanks. Finish the Battle Company. I've been avoiding the last two squads for too long. -Run a 1st Edition campaign for some pals. Almost ready to begin. -Start a revision of RT to condense/modernize the ruleset. Working through my backlog. I've earmarked 100 models I want to work on. Most are at least base coated already but lots need highlighting or other detail work. I've kept the goal simple though: I'm not allowed to buy more models than I finish. This is more tricky than it sounds as I usually buy multiple boxes at a time or get bundles. More than likely sell off my 40k stuff and focus on WQ:BSF as my 40k fix. I don't have the time anymore for mass scale combat games, and while the miniatures are truly wonderful the current 40k edition is a hot mess and just leaves me cold. I've started on an all primaris black templars army. Planning on doing primaris conversions of all the current special characters. Black tide primaris edition could be interesting. GW kinda did me a favour. Ever since they introduced Primaris, I no longer have any desire to do an Imperial SM army. Thats left me available to do the many Xenos armies I've always wanted to do. But first, I have to finish Death Guard. I've already airbrushed and done all the chipping rusting effects on it. Now, I have to go in and hand paint the rest. I also have an Empire, Wood Elf and Beastmen army for WHF to finish. Also, I want to start DE again since they were unchanged with chapter approved. They'll probably end up releasing Black Legion or Sisters of Battle so I'll probably have to get those too. Finish assembling the contents of the Silver Tower box I got over Christmas. Painting is not a priority as I intend to use the game as a means to ease my girlfriend into the idea of miniature war gaming. Finish painting my all-scouts kill team as soon as I get them back from the guy who's priming them from me. Finish painting my Stormcasts Start Collecting! and be ready for my first game of Age of Sigmar. If all goes well with the Silver Tower, I'll also pick up Shadows over Harrenhal and Blackstone Fortress. Finish my goal of being able to field an entire Brigade of green wing only Dark Angels supported by a Spearhead of tanks, a Vanguard of Deathwing Terminators and an Outrider of Ravenwing Bikers before any of those models are discontinued in favour of their new Primaris equivalents. Ayuh, me too. I've long been back-and-forth on starting an <IMPERIUM> army to 'restore' 'order' to my planet, but Primaris finally nailed the lid on that idea shut for good. Putting together an Iron Warrior army - I love the organic/machine mashup look of helbrutes and forgefiends. I've got some skitarri leftover from a purchase of Forgebane, I'm planning on getting some third party bits and use them as cybered up cultists. And one resolution, not to move onto a new project until I have completed the one I'm currently doing. Urgh, to drown in projects again, mostly. Maybe even try to write a cohesive battle report or two. Unless some shiny new models come out for Death Guard, I solemnly vow to not purchase another model (except for my Conquest subscription) until I finish painting my pile of shame. I mean start my Ravenwing. I've got various bikes and 3 land speeders to build or repaint. Been meaning to do it for ages, but got distracted by Kill Team and then Orks. I was shocked to learn that in order for me to use my Haemonculous Coven list, I was going to be forced to add Scourges (because Brigades). I was a bit surprised by this essentially mandatory addition for Coven Brigades but that is what I'm working on. Making matters slower i quickly realized that these are extremely top heavy so i had to experiment with weights on a slotta base. I settle on Buckshot as the answer ($45-$60 for a bag plus glue isn't cheap). but weighing them down and painting them is the project on hand. So I started a new project after receiving an airbrush and an Imperial Fist Battleforce box for the holidays - decided to go Crimson Fists. Finish up my 3k list in terms of painting. Edge highlight and get them all to the quality of my Levithian Dreadnought. Start my Eldar army scheme and get a test model out by Mid Summer. I'd like to finish painting my Space Hulk 4th edition miniatures. And 3rd edition. And 1st edition. I'm fairly sure that, by definitionm, nothing shiny and/or new is ever going to appear in the Death Guard arsenal. 1,2 and 3 all ticked off! My plan now is to keep buying WD and to keep playing! I hope that either vigilius 2 or the spring FAQ is going to add primaris to the GK codex. If that happens I would try adding some of them. My painting goals for the year were to paint 2000 points of my Crimson fist army but so far since mid December I've already smashed through 800 points worth so it's going very well. DKK Grenadiers, Custodes dawneagles and a Gorkanaught. Firstly I plan to finish my 2000pts Tau tournament list, i'm going to try to make it to a few GTs this year. Almost done, everthing is painted and based, only have 24 firewarriors out of 72 left to edge highlight and do the detail work. Second finish the 7 out of 10 custodes bikes I have left to paint, they're all basecoated, washed, shaded and based, so more detail work. Got 3 Allarus Custodes to assemble and paint to round out the 2k points. Not exactly 40k but I'm going to rebuy and paint all the 54mm Inquisitor figures (nearly a complete collection) I somehow lost in the house move. 54mm Artemis is in the post and I even managed to source the super rare helmet booster pack for him. Looking forward to this project a lot, the 54mm scale is a joy to paint. I might even try to introduce my mate to the game once I have enough models painted up. I've always wanted a necron army, so a 2000pts Sautekh list will be a fast project for the year. Had Obyron and Zahndrekh for christmas, Obyron I've already painted. Battle sisters army when the new line comes out. Co-project, already have Celestine my girlfriend painted. Possibly start the Eldar and Dark Eldar armies that I've wanted to do for ages, Dark Eldar tournament list is probably the priority, Eldar list will be just models I've always loved, fire prisms, wraith heavy. Yeah, I have a lot sitting on my painting desk. Probably too much. This year, my goal is to completely finish my projects before moving onto the next one. Too many times I get about 75% done with a squad/unit or model, put it down, and pick something else up. Are you 100% dedicated to the ideal of having only GK keyworded units in your force? Because if you're willing to Battleforge your army as Adeptus Astartes you could add those primaris right now. Run your army as two detachments. 2nd detachment = Primaris (from whatever chapter you please). Obviously paint them to match your GK. Buy two Lightnings, scratch build triple twin-link autocannons for them. Start on Thunderbolt squadron (once they go on sale again) find bomb clusters for them. -Get rid of some of the armies I never play, or at least of some of the models that I absolutely know will never be painted or be set up on a table for a game.